Ticks and Fleas a year round problem. By Richard H. Pitcairn, D.V.M., Ph.D.
Black to brownish-black, about one-twelfth to one-sixteenth inch long; six legs, with many bristles on body and legs; flattened body. Habits: Found on cats and dogs year-round, but most common during warm and humid weather; readily attack and feed on humans; can jump as much as seven-eighth inch vertically, and 14 to 16 inches horizontally. *Carrier of many diseases; adults can live one to two months without feeding. *A number of diseases are transmitted by fleas, including epidemic typhus and bubonic plague. *Fleas also carry tapeworms from dogs and rodents and occasionally transmit them to humans. *Fleas are generally less than three-sixteenth of an inch long. *More than 2,400 flea species exist worldwide. *The lifespan of fleas on dogs is usually more than 100 days, in which time a pair of fleas and their descendants can produce millions of offspring. *A female flea consumes 15 times its body weight in blood daily. 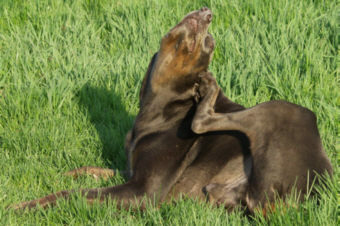 *Fleas are attracted to animals by body heat, movement, and the carbon dioxide they exhale. *Fleas accelerate the equivalent of 50 times faster than a space shuttle does after liftoff. *Fleas can jump up to 150 times the length of their bodies - sideways or up - equivalent to a person jumping nearly a thousand feet. Mainly because of their overwhelming capacity to reproduce, fleas can become nagging nuisances for homeowners. However, there are several precautionary steps which can help control these critters. Vacuum, Vacuum, Vacuum. ... carpets, rugs and furniture often to remove flea eggs, larvae or pupae. Place the vacuum bag in plastic and remove from your home. Screen foundation vents under the home to keep wild animals from wandering under the house and creating their own flea breeding ground.